Sofabet’s review of 2013’s X Factor series is going to be shorter than our reviews of previous series – this is the first of a planned three articles, which we will publish over the course of this week. We just don’t feel there’s that much to write about this time around. 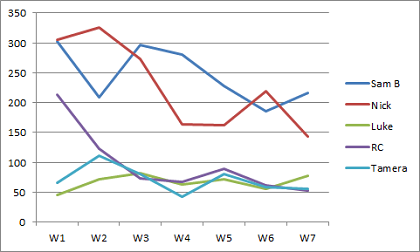 Usually the revelation of the voting statistics casts interesting new angles, but this time we reckon the theories floated in our pre-final journey pieces (Sam, Nick, Luke) stack up pretty well having seen the stats. And the things that had us scratching our heads before the statistics still have us scratching our heads, such as: when and why did they cool on Tamera? What on earth possessed them to pimp Nick so much in week 6? Were they subsequently hoping to dislodge the wee Scot before the final? Why the semi-final singoff? With the help of some graphs, let’s try to reverse-engineer producers’ thought processes throughout the live shows. It seems clear enough that giving the first three pimp slots to Rough Copy, Hannah and Tamera respectively indicates that producers were initially hoping that at least one of these acts would catch fire. None really did. Rough Copy did best from their chance at closing the show, polling third in week 1, and were given the penultimate slot in week 2 to try to continue the momentum. But they slipped back, and Hannah misfired from the pimp slot. Tamera, though, did pretty well in week 2’s vote, so producers must have had high hopes when giving her week 3’s closing slot for ‘Listen’ (while also not helping her fellow girls, sending Hannah up in flames for ‘Skyfall’ and reducing Abi to tears after ‘Moon River’). But she bombed, doing significantly worse than her week 2 vote. As we surmised in our piece on Sam’s journey, we presume this was the point at which producers gave up on getting Tamera or one of the Croydon acts to win, and settled for pushing Sam instead. 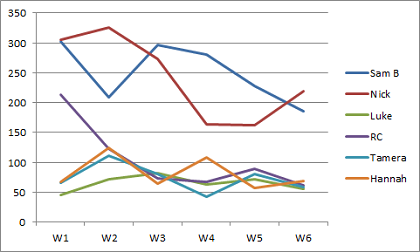 Presumably producers felt the need to give Nick a pimp slot at some point, for plausible deniability against accusations that they didn’t want him to win; we reckon there must have been some debate ahead of week 5 about whether they could afford to do it then, given how sharply his trendline is pointing downward. In hindsight, his ‘Dream A Little Dream Of Me’ might have given him much less of a pimp slot boost than ‘Someone Like You’ ended up doing a week later. But you can understand why they felt the need to put Sam Callahan in the pimp slot instead. This was the week they set out to get Abi, and it would have been awkward to ditch her in a singoff against Sam given his new role as Gary’s punchbag. (This, of course, was another instance of Gary delivering an unexpected critique – or, rather, non-critique – after the pimp slot). With Sam’s trendline flatlining, it must have seemed that he could have been in danger had he been on any earlier. Week 7 is the only week out of weeks 6-9 that we feel we understand. Clearly they were hoping to get Nick back below Sam; give Tamera a second chance at a breakout week, which she fluffed; work with the grain of Luke’s bounce, and Hannah’s comedown; and guide Rough Copy into the bottom two, from where they could be saved. But as for longer-term thinking at this point, who knows? We would guess that going into week 7 producers might still have been gameplanning scenarios in which they could get a final three of Sam, Tamera and Rough Copy. 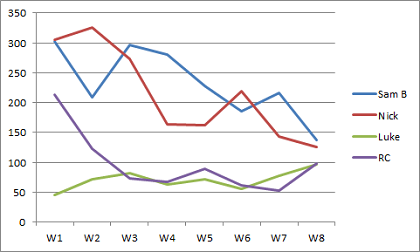 Such a scenario would have looked something like this: a breakout performance from Tamera in week 7, with Rough Copy getting the historically-significant week 7 singoff save bounce; Tamera saved over Luke in week 8; and Nick coming into range in week 9. Considering Rough Copy were due a bounce, Tamera would have needed lots of help to escape the bottom two, and didn’t get it – producers must have regarded it as impossible to keep her safe even if they’d wanted to. This was the week Nick was backed for elimination down from 16/1 midweek to 3/1 after Satuday’s show. So were producers hoping to get Nick into the singoff? Based on the above graph, you would have to say it looks plausible. 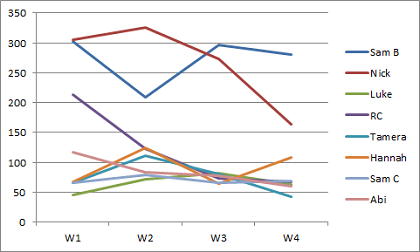 That gentle application of brakes that started in week 7 had brought Nick’s trendline pointing sharply down; they might well have thought it’d be possible (challenging, but possible) to pimp both Luke and Rough Copy above him. That’s certainly consistent with their treatment in the show. However, it implies that they’d have intended to save Tamera over Nick had they got those two in the singoff. And that’s not consistent with the fact that they saved Luke over Tamera. If they were always going to lose Tamera, and held out no hope of getting Nick, why put such effort into pimping both Rough Copy and Luke, rather than choosing just one of them? A lot closer than most of us would have guessed at the time. Which makes it all the more surprising that the story of Sam’s “diva demands” appeared in the Sun on the morning of the semi Saturday – at the time we assumed she was so far clear they could afford to plant such stories simply for the column inches, but as it turned out she was only 3% off the singoff in that semi vote. 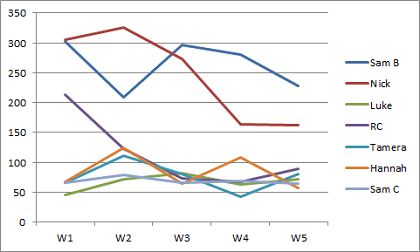 The closeness also makes it all the more surprising that they held a singoff – with Rough Copy having barely beaten Luke in week 8 with the benefit of a bounce, it must have seemed inevitable that they would drift to the bottom in their comedown week. And if producers had been willing to lose Rough Copy, you would think they’d have desisted from dicking around with the format. There’s a reason, after all, why they usually go to public vote only at this stage: to go into the final with tension about who has momentum. Even in season two of the US X Factor, where they experimented with announcing the order every week, they didn’t do so at the semi-final stage. So producers must have had some compelling reason to sacrifice this time-honoured part of the format. As described by Rob at entertainmentodds, the line on whether there would or wouldn’t be a singoff kept changing throughout the week. There are two obvious ways to interpret this. One, proposed by Richard Betsfactor, is that they were simply keeping the singoff in reserve as a way to fill time on the Sunday show if a hoped-for special guest didn’t come through. But it’s a possibility every week that an intended Sunday guest might cry off at the last moment. Surely they must always have some kind of backup plan for filling screentime, that they could have wheeled out instead of a singoff? The other explanation is that they kept changing their minds about what they wanted to achieve, or thought they could get away with, and ended up failing to execute any kind of plan cleanly. Sharon was supposed to have saved Rough Copy, but went off script. (You can make a case that Sharon, Gary and even Louis – in the extent of his anger about Tamera – were occasionally dancing to the tune of a different drummer this year. But the working assumption that judges save who they’re supposed to save has served us so well in the past, we’re reluctant to abandon it now). Do you have a clearer view on what producers were up to in weeks 6, 8 and 9, having seen the figures? Do let us know below. Gee that all seems like a lifetime ago! Off topic but have a listen to this in the next 48 hours before it disappears, Simon Fuller who devised Pop Idol talks about the show, why he invented it, what it needs in it etc. Given Cowell was part of Pop Idol you can bet a lot holds true about X Factor. Doesn’t it seem like a lifetime ago! Cheers for the link, will check that out today. We just don’t feel there’s that much to write about this time around. I was wondering what Sofabet would be covering in the review articles and am in agreement. It was a bit of a baffling series for me but I get the impression that at some point, there was a decision made that the voting public would be allowed to get their way for once. A win for the people’s champion if you like. Perhaps also an attempt to clean up X-Factor a bit and move away from tactics like railroading an unpopular act through (think Cher Lloyd and Misha B) and prompting the judges as (allegedly) happened in the first live show in 2012 in the Carolynne v. Rylan sing-off. They went on to explain that, if this rule had been implemented years ago, the show’s resulting winner would’ve been very different year-on-year. I’d been wondering if they might try that at some point ever since we did those back-of-an-envelope calculations that phone vote revenue must be only a tiny fraction of advertising revenue. We had free voting in the US this year; I got 50 (!) free votes per week for logging on to the official website with a (dummy) Facebook profile. We also had XF songs charting on iTunes – I understand they don’t in the UK? – and the placings were completely predictive of the final 4. I suspect they broke down the voting after the season and found that the internet did a lot of heavy lifting for Restless Road and Alex & Sierra. The idea that they’d already given up on Tamera makes some sense of decisions like Diamonds Are Forever and the song in the wrong key. They just weren’t that bothered. I clung to the belief that she was the chosen one long after the evidence was suggesting that she couldn’t be. Nice of them to point out that the talent avoiders that are 1d & Olly would have won under the free voting system. Did they also point out that they can’t sing, or this is a made up statistic, or that Elvis would still be alive if he hadn’t died? As they now have their female winner and an over winner, I’ll assume the free voting is to make it easier to ensure a young male winner this year. I never saw Tamera as Plan A. I thought it was Nick but it soon became apparent that it had been Sam B all along. I think they originally wanted a Sam B, Nick, RC, Tamera top 4 but they knew Tamera would have too many issues to go all the way. The show was supposed to soften her to the public but she messed up too much (I say she messed up, it could be they messed her about). The most interesting part of the series is the treatment of Luke. His JH’s audition was awful but the big change to make him a top 3 was a big switch around. And to say he would have beaten Sam B hints at Syco giving him the most post-series backing. My take on this is that they are lining him up to replace foul mouthed mongoose James Arthur who has become too much trouble and has had a massive plummet in sales since his public verbals. I see making votes free as a desperate attempt to cling on to audience and/or reach out to a new audience; and this series being a last ditch attempt to do ‘old’ X Factor with ‘family fun’/older audience appeal Sharon Osbourne, campy dare I say ‘cruise ship’ Louis, and Gary Borelow trying to be credible. Next year will see a big shift younger and a lot more colour vomit; Louis back with the overs and more Johnnys, Kittys and Goldies who havent a hope in hell of winning. And frankly, the show’s gone so far from the show I used to enjoy for the talent that I’d welcome such a change completely from a fake ‘talent show’ to something I can actually enjoy watching in between the ten minute ad breaks! Welcome to Sofabet, saturunfudge, and thanks for moving into the fold. Part three of our series review will show that pollsters found it increasingly difficult to sample voters because their numbers continued to decline, as you have suggested. I used to think that Tamera was their top bet, but conventional wisdom says that picking Sam Bailey and Nicky (two vote sponges) wasn’t going to help the cause. There were also articles about Max Clifford (the guy who taught Simon how to do those one-liners) being the man behind the SamBa pimping. I remember throwing a question about Tamera being a decoy… and I might have been right. After her double whammy (I just have to say that the second time wasn’t a lyrical flub, it was just her starting too early and not knowing what to do with the extra bit before the chorus), they were probably just going to let her run her course. Add to that the stronger pimping given to RC (you have to be in the final, you are the best group on XF evar blahblah) and all the love for Hannah Banana and all those mixed signals are pretty much derampers, at least in the long run.